* A team of internationally recognized Coopers & Lybrandmanufacturing consultants explain why they believe the businessworld needs to move beyond continuous improvement and TQM conceptsto Business Process Reengineering (BPR). * BPR involves a dramatic redesign of business processes,organization structures and use of technology, to achieve"breakthroughs" in business competitiveness. * The book is based on the authors experience of extensiveinternational work with leading corporations including AT&T,Asea Brown Boveri (ABB), Allied-Signal, and Coca-Cola &Schweppes (CC&SB). 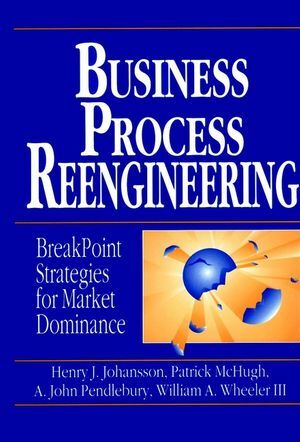 * Focusing on the effectiveness of BPR, the book shows howcompanies can streamline operations, and inevitably cut costs, onthe way to creating process excellence in all key aspects of theorganization. About the authors Henry J. Johansson is the Chairman of the Coopers& Lybrand (C&L). Manufacturing Industry practice. He hasbeen responsible for the firm's most significant consultingengagements in the area of implementing new technologies to enhanceperformance and competitiveness. He is a certified managementconsultant and a certified practitioner in production and inventorymanagement. He is on the Board of Directors of the OperationsManagement Association and on the Board of Advisors for the Journalof Cost Management for the Manufacturing Industry. Patrick McHughis a Partner in C&L's Commerce and Industry ManagementConsulting Division. His extensive international work has includedadvising manufacturing companies, governments and the public sectoron areas from competitive strategy and industrial policy totechnology management. He founded the Engineering Group in the UKand the C&L International Centre for Technology and EngineeringManagement. He is currently the Partner in Charge of the firm'sconsulting activities in the technology and engineering industries.A. John Pendlebury is currently the Partner in Charge of theManufacturing, Engineering, and Logistics Consulting for the UKbranch of C&L. He is responsible for 200 professionals in theUK occupied with strategy and implementation in the abovefunctional areas. His career with C&L began in 1973 and has ledhim to work within branches in the USA, USSR and throughout Europe.He has overseen a multitude of manufacturing, logistical, strategicplanning, industrial administration, and restructuring projectsduring his time with C&L. William A. Wheeler III is a Partnerin the C&L Management Consulting Services Group and isresponsible for the National Just-In-Time (JIT) and ManufacturingStrategy practices in the USA and the International ManufacturingStrategy Center of Excellence. He has participated in and managednumerous domestic and international consulting engagements thatinvolve the major elements of strategy and productivityimprovement, including: quality, engineering, and materialssystems. He has won international recognition for his contributionsin the field of JIT. He originated the concepts of Co-OpContracting and BreakPoint Manufacturing Strategy, which have beenadopted by major corporations throughout the world. What Is the New Thinking?. Putting the China Back Together. Process Management in Large Businesses. Organizing and Managing for Success.